Details of Stars Lane House are somewhat scant and I know of no photographs or other illustrations. 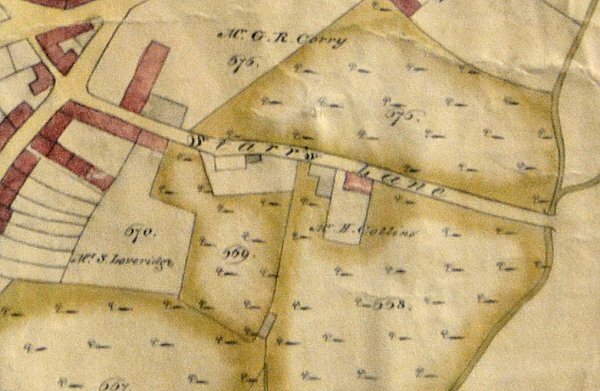 It was one of very few dwellings in Stars Lane on Watt's map of 1806. At this time Stars Lane reached all the way down to Dodham Brook and Stars Lane House was shown as isolated amongst orchards about halfway between South Street and Dodham Brook. Watts noted that the owner was Mr H Collins. The 1846 Tithe Apportionment noted that the owner was Ann Collins and the occupier was John Hawkins. I have a document in my collection, dated 1875, in which Samuel Cridland leased from Yeovil Corporation the property known as Stars Lane House and a large area of land off Stars Lane - essentially what is now the whole of Stars Lane car park. In the lease the description of the property is almost word-for-word identical to that of the Terrier quoted above. 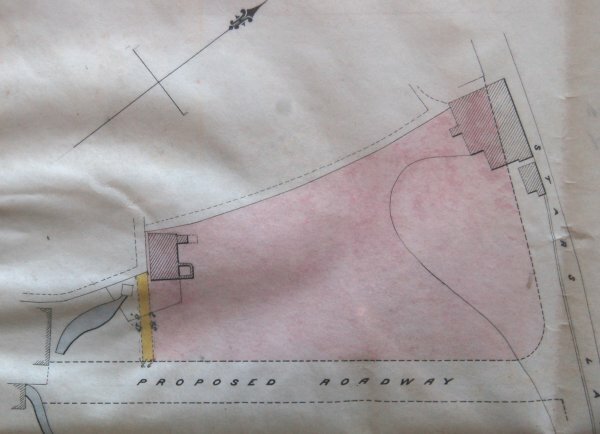 The plan from the lease is reproduced below and it is clear that Stars Lane was planned to be widened which meant the demolition of Stars Lane House. The 'proposed road' on the map was to become Summerhouse Terrace and pretty much all of the Stars Lane House orchard and garden was about to be built on by creating Talbot Street and Summerhouse Terrace and, ultimately to become Stars Lane car park. As a side-note, Samuel Cridland was born in 1835 in Bradford Abbas, Dorset. He was a Master Mason and in 1881 was living at 16 South Street with his Oxford-born wife, Susan née Rowland. Also living with them were sons Ned and Herbert, both masons, dressmaker daughter Kate, Lucy and youngest son, William, both scholars. William Cridland was later to become the landlord of the George Inn in the 1890's. E Watts' second map of Yeovil of 1806 showing Starrs Lane. Stars Lane House is noted as belonging to Mr H Collins. 1877 map in my collection showing Stars Lane House and its gardens coloured pink.